Posted by Dissent at 11:53 am	Hack, Miscellaneous, Non-U.S. The Police Federation of England and Wales has been hit by a second cyber attack. The organisation, which represents nearly 120,000 officers, said the ‘multi-pronged, sustained’ attack came at about 2.45pm on Thursday. It affected a number of databases as well as the advice website set up to deal with the first attack on March 9. Read more on The Portsmouth News. The NCSC issued a statement on March 21. 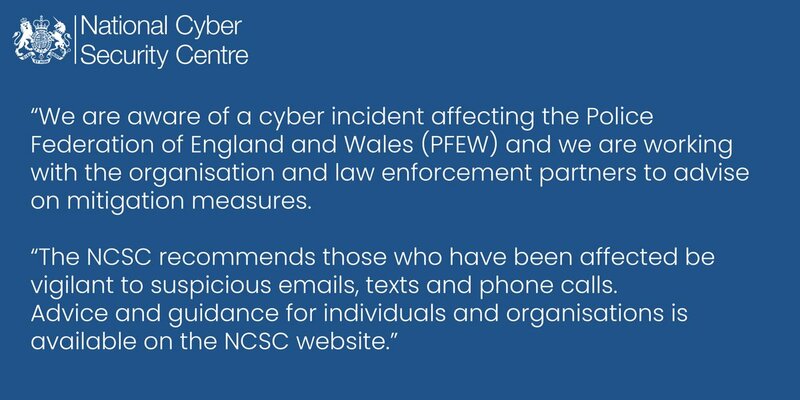 “We are aware of a cyber incident affecting the Police Federation of England and Wales (PFEW) and we are working with the organisation and law enforcement partners to advise on mitigation measures.